Burst washing machine hoses have to be one of the most common causes of catastrophic water damage in homes. When I find rubber hoses used to connect the washing machine, I often mention to my clients that it's a good idea to replace them. It's downright disturbing how often my client then goes on to share a story with me about how they already had a flooded house or knew someone who's house flooded because of a failed washing machine hose. When I was about ten years old, one of our rubber washing machine hoses burst while we were gone for a few hours. We arrived home to find an inch of standing water in our fully finished basement. That was one heck of a mess. Every time a washing machine shuts off the water, a shockwave is sent through the water pipes - remember my blog about water hammer? While installing a water hammer arrestor at the valve will protect the pipes downstream from the valve, this does nothing to protect the rubber hoses between the valve and the washing machine from water hammer. The video clip below, courtesy of Sioux Chief, gives a great demonstration of what happens to the washing machine hoses every time the water is suddenly turned off. The text in this video mentions plastic pipes, but the effect would obviously be much greater with rubber hoses. As rubber ages, it loses it's flexibility. 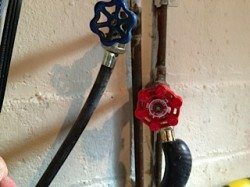 After being subjected to water hammer over and over for many years, the rubber washing machine hose is eventually going to fail, and it's going to be one heck of a mess. Here are a few suggestions to lower the risk of your washing machine hoses suddenly bursting. Washing machine manufacturers actually tell you to do this in their installation instructions. The text below comes directly from a Maytag washing machine user manual. I can tell you from experience that it's extremely rare for anyone to actually do this. I've heard that a good rule of thumb is to replace rubber washing machine hoses every five years. That sounds good, but how do you remember? Another tip I've heard is to replace your washing machine hoses every leap year. Not a bad idea. You can purchase an emergency shutoff kit, such as the type sold by Floodstop, which will almost surely prevent any type of catastrophic leak. These devices come with a water sensor, so if a leak is detected, an alarm goes off and the water supply valves automatically close. These kits are battery powered, and according to the web site, can be installed in about 10 minutes. Not a bad idea. This is the simple advice that I usually give during home inspections. 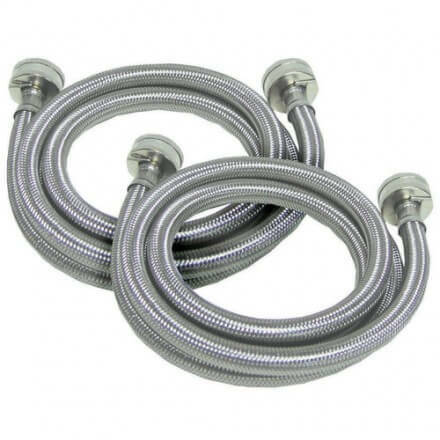 Stainless steel braided hoses are much more resistant to bursting, and they're fairly inexpensive. You can buy a pair on Amazon for under $17. There's a new version of these hoses called Floodsafe®, which is supposed to completely shut off the water supply in the event of a burst hose. I did a little testing with these hoses, and I'm not a big fan. I'll post a follow-up on this topic next week. In the meantime, do yourself a favor and pick up some new washing machine supply hoses. On a project difficulty scale of one to five, replacing your washing machine hoses falls somewhere between zero and one. If you can connect a garden hose to a faucet, you can replace your washing machine hoses. Just use a wrench to loosen the old hoses, and give the new hoses an extra 1/4 turn with a wrench after you have them hand-tightened.